Age 69, of Dover passed away Monday, January 28, 2019, at his residence. He was born August 25, 1949 to John and Lorraine (nee Bukachek) in Racine, WI. His early life was spent in Racine where he graduated from Park High School. Mark resided in Dover the past 47 years. 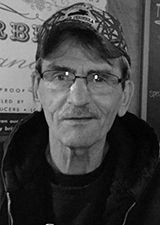 He was a truck driver for Jung Brothers Trucking Co. Mark was an avid outdoorsman; he loved riding ATV’s , hunting, fishing, golfing and had a great love of history. Mark is survived by his brother John (Lynn) S. Rickard, nieces and nephews, John M. Rickard, Amy (Terry) Ware and Laura Koehn, other relatives and friends. He was preceded in death by his parents. His family would like to extend a heartfelt thank you to Richie Coburn, Judy Vliet, Travis Vliet, Michelle Vliet-Ginder, Teresa Rode and Lorie Mueller for their care and compassion. Funeral Services will be held on Saturday, February 9, 2019 at 2:00PM at the Polnasek-Daniels Funeral Home. Relatives and friends may visit the family on Saturday from 11:00AM until 1:45PM at the funeral home. Burial will take place on Monday, February 11, 2019 at 2:00PM at the Yorkville Cemetery.